We offer lessons to riders from ages 4 to 70 plus. You don't need to have ridden before. Our horses are kind and gentle and we have experienced instructors and volunteers who will offer their support as you learn. 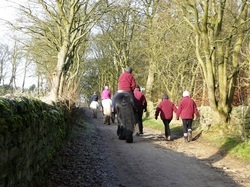 As well as the indoor school we are able to ride out on the bridleways around St Ives giving a sense of freedom to our riders as they can access on horseback places and views normally denied to them. The physical activity if sitting on a walking horse mimics the action of the human walking gait stimulating and exercising the whole body, especially strengthening the abdominal core muscles and legs. Parents, carers and our participants report knock on effects with physical, mental and emotional improvement leading to an increased quality of life. For those riders who wish to take part there are competitions from RDA local, regional and national level. Our more experienced riders also have the opportunity to take part in show jumping events up to level 3. These give an incentive and focus to improving skills and takes our riders out of their physical and mental comfort zones as well as stretching them socially. All participants taking part in our riding sessions must wear sturdy boots and gloves during their lessons. Riding hats can be supplied to those who require them. Potential riders are initially invited to visit and meet our instructors and volunteers and to complete an application form. You will then have an assessment with one of our instructor in order to discuss your individual requirements and tailor your lesson. If you would like more information on this or any of our other services please get in touch via our contact us page or alternatively, call in to the Equestrian Centre on a Wednesday between 10am - 2pm. St Ives RDA have now introduced a Cancellation Policy for our riding sessions. This can be found on our 'Further Information' page or by following the link.